Huge anvil-shaped thunderheads coming your way are lightning factories: bad, bad news. Mind the “30/30″ rule: if you see a flash and hear the thunder within 30 seconds, you’re potentially in danger, and you will be for 30 minutes after you see the last flash. Enclosed, hard-roofed areas with the windows closed are generally safe; convertible cars — and tents — are worthless. Avoid open areas like clearings, meadows, ridges and hilltops. Try to hunker down in forested areas with a large number of trees of uniform size. GetOutdoors.com (the GoBlog gang) has a refreshingly mature page of advice on avoiding getting toasted. Hiker Hell interviews a mountain rescue expert. Ehow.com has an eight-step safety guide. About.com notes that lightning does in fact strike twice in the same place. Struckbylighting.org has tons of facts, figures and helpful links. People joke about the odds of being struck by lightning, but being outdoors definitely improves (well, worsens) your odds. Don’t expect to be as lucky as Roy Williams, the guy who survived seven strikes. Subscribe to comments with RSS or TrackBack to 'Lightning: don’t get struck'. Ok, so I know that this is probably not the correct post to ask you about this, but oh well. I want to purchase a set of Merrells. Now, I personally wanted some ankle support, but the mid height ones seem to go really high and limit your movement. Any suggestions? It was a great question, I answered it here. From my college Physics — a charge cannot reside on both sides of a metal sphere. A car approximates a metal sphere. Get inside. 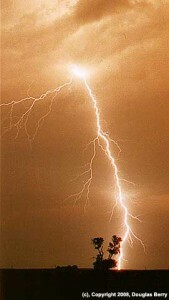 Lightning may strike the car but it will not penetrate. Ditto airplanes. In a car you also benefit from rubber tires insulating the ground. Good call including 30 seconds as a rule of thumb for the time to wait between seeing and hearing a strike. It’s a common misconception that sound travels 1 mile per second, so some people might think that 30 seconds wait means the strike was 30 miles away. Wrong! I don’t know why this wrong idea is so prevalent. Sound really travels about 1 mile every five seconds.